Add text and you can more accurately deliver ideas, meaning and understanding. With this personal project, Warwicker has produced a new kind of book. 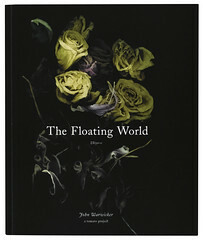 Melding images, quotations and his own writing, elucidated via layout and typography, Warwicker orchestrates a poetic reading / viewing experience that both informs and entertains. 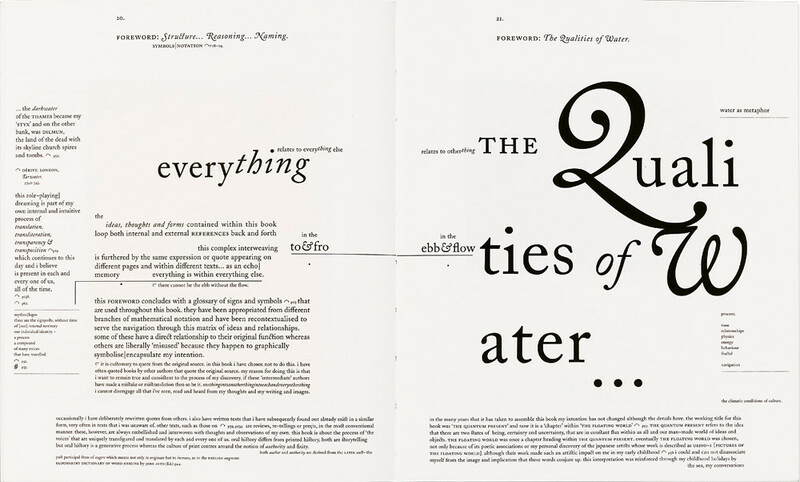 At times it ‘sounds’ like music; the arrangement of words offers more than one route across the page, effortlessly. The flying punctuation, the italicised side bars, the subtle colour shifts – after this, a ‘normal’ book feels bland, dumb and scrappy. But I ask where to start not out of exasperation, more like exhaustion. There are so many references and strands; some ideas are familiar, other sources and musings appear oblique, and possibly deliberately shrouded. I hesitate to suggest what this book is about, as each reader will find a different emphasis. Veering from ancient literature to pop culture; from reflections on cities, technology, wilderness and the elements, to investigating notions of creativity, consciousness, knowledge and representation, this book is literally all over the place. Warwicker hasn’t constructed a watertight argument but spun a web, creating a network of references to ignite interest, hoping that the reader will explore further. Typography, drawings and photographs of urban and rural fragments and views are all used to affect the pace and tone of his offering. From reportage to musing, from textual analysis to a barrage of thoughts (he overlaps quotes, repeats lines), there is no one narrative but always his presence, questioning, observing and remembering. This is the story of a designer, an artist, a child and his grandfather. Back to the end user. Because of its personal insights on the process of drawing, alongside an exploration of the nature of creativity, a painter or a philosopher might enjoy it. Whether it ends up on the coffee tables of young designers, or people who have bought other ‘tomato projects’ or on reading lists handed out by design educators, depends on just how much time they give it, and how open to contemplation they might be. At first look, it exudes ‘difficult’. But, go with the flow, pick it up and put it down, read and re-read, stop and look, and this book will begin to give up its secrets, sometimes quietly, other times, insistently. I admit to having been intimidated; now I could keep reading, and reading... and not just because it’s 400 pages long. Cover and spread (top) from the foreword of The Floating World: Ukiyo-e. Design, images and text by John Warwicker.